ЄС – Центр "Нова Європа"
Article by Kateryna Zarembo on the development of Ukraine-Italy relations. Report by Leo Litra, Senior Analyst of the NEC, on assessment of Ukraine-EU relations for the quarterly magazine ТRUMAN Index. What Should Western Strategy regarding the Russian Aggression in Ukraine Be? The paper includes a set of draft policy recommendations for political and non-political actors from Georgia, Moldova, Ukraine, Romania and a set of recommendations for EU decision makers. Atrophy of Trophies. 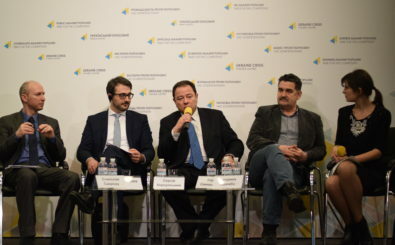 How Can Ukraine Take Advantage of the Vulnerabilities of Russian Policies in the EU? Analysis of successful cases of countering Russia’s interference in Germany, France, Italy, Poland, Greece, and Hungary. Sanctions against Russia: how to preserve the European unity? The main talking points of the speakers of a round table on EU sanction policy toward Russia, which took place on December 5.